For over 20 years, Catering By J Enterprises has been bringing traditional Southern style cuisine to the men and women of Wisconsin. With our full service catering company and banquet hall, we can accommodate any type of event, from a casual party to a black tie affair. When we first began catering in Sheboygan, WI, in 1993, we were focused on pig roasts and fish boils. These events were always a hit and remain so today! However, over the years we have expanded our services and are now proud to provide full catering services for all types of events, from birthday parties to weddings and more. While we have branched out to provide a new host of services, we have remained true to our roots, continuing to serve traditional Southern favorites, including country fried chicken, sliced ham and country style ribs. Our understanding of this regional cuisine allows us to bring these authentic recipes to large groups, allowing them to discover new favorites and enjoy the savory goodness that comes with old fashioned Southern cooking. We serve authentic Southern style cooking. 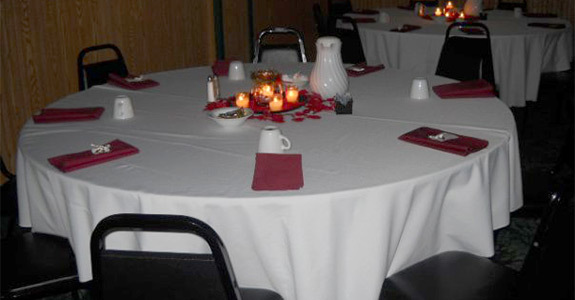 We have a full service banquet hall that can seat up to 275. We provide everything from linens to tables to china. We bring 20 years of experience to catering and cooking. For delicious Southern cuisines, there is no better name in the business than Catering By J Enterprises. Fill out the form below to get more info and learn how we can help you!